It was a pleasant surprise to see that Windows Phone Mango includes some improvements to the Bluetooth stack, which means I now see the name of the currently playing track in my car. This gets added to the already existing ability to pause, fast-forward and rewind directly from the steering wheel, so now I can do just about everything from the Zune software on my phone while driving. WMPowerUser.com has a more information on what has been the Windows Phone Bluetooth stack, if you fancy being nerdy about it. do you have any comments on the bluetooth audio quality? Is it improved? I noticed grain and static in the background when listening. Also, does album art get displayed with the new BT stack? I’ve never had any issues with the quality of the music when I use the Bluetooth with my car, but I have noticed that the volume can sometimes be a little low -I think this is because it uses the phone volume too. 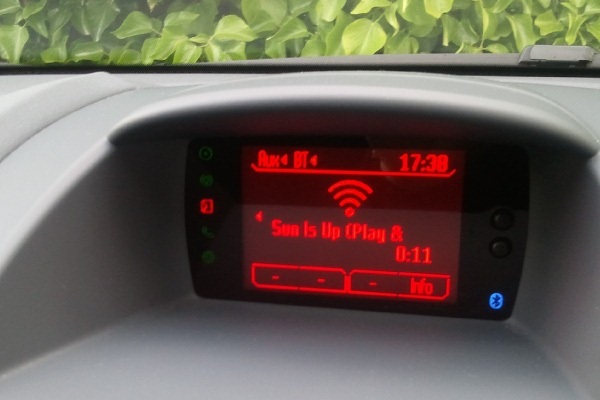 My car (Ford Fiesta) doesn’t have the ability to show album art, and I have no idea if it works for anyone else. I don’t think it’s mentioned in the linked article, so I’m assuming this is not the case. It’s worth noting that the phone voice control also works through my car, meaning I can read back and reply to texts without touching the phone. Pretty cool. My car (Acura) has bluetooth support for making phone calls, however I’m not aware of the ability to play music over bluetooth. I’m guessing your Ford is equipped with Microsoft Sync. Is that correct? Are you aware of any way to accomplish what you’re doing in a car without Microsoft Sync? My UK Ford Fiesta does not include Ford Sync. It is just seen as a normal Bluetooth audio device – much like a generic headset. I am unsure about your car – but the Microsoft automotive software is not a requirement for playing music. Maybe yours doesn’t support the required Bluetooth audio profile?